How cool! There's a live camera feed set up at various points on the Panama Canal. 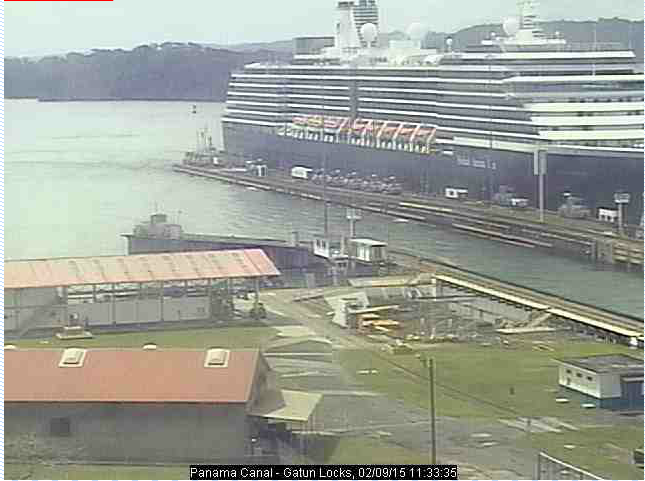 click here to access the website to Panama Canal's live cams. No guarantees it's working, or that we'll even know the exact time of our transit. As we get closer, I'll post my best guess. Currently we're set to begin our transit this coming Friday, February the 13th, 2015, a 2-day transit. Fortunately we do not put much credence into the "Friday the 13th" superstitions. Odd place for us to spend Valentine's though we're looking forward to sharing it with our "line handlers" - friends and family joining us for the transit. Watch for an update if you're interested. When eavesdropping on a portion of the ARC circumnavigation rally canal prep lecture at Shelter Bay, its presenters noted "In all our rally participant surveys, transiting the Panama Canal repeatedly comes up in a list of top 5 experiences." We're currently in Portobelo (N09.21.872 W79.53.611), a few hours sail from the canal, waiting for our tires (fenders), special line and friends and family for our canal transit.